Those of you who follow my blog know that I don’t post about deal very often and when I do it’s because it’s a great deal on motorcycle/scooter related clothing or equipment. I just purchased a pair of summer mesh/leather gloves that are so good that I ordered a spare pair! 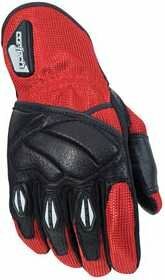 You can purchase the Tour master Cortech GX gloves at Motorcyclegear. These are by far my favorite gloves ever. I found them true to size and they started slightly tight but thanks to the give of the leather (they are mostly mesh with a little leather) they gave just the right amount to be a perfect fit.